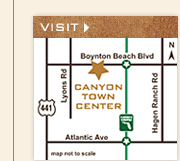 Canyon Town Center has transformed the landscape of western Boynton Beach! This upscale neighborhood center not only offers an excellent array of shopping, dining and service choices, but it's also a place where friends and neighbors can gather. An interactive fountain is fun for kids of all ages and the Amphitheater is the site of many fun daytime and evening events including live music, performances, family fun days, karaoke and movies under the stars. The Center's soccer field regularly hosts league play. The friendly merchants of Canyon Town Center include a supermarket, banking, postal services, pharmacy, dry cleaning, several restaurants, salons, fitness, child care, children's clothing, boutiques, medical facilities and so much more! Canyon Town Center is conveniently located in Boynton Beach just 1/2 mile west of Florida's Turnpike on Boynton Beach Boulevard. Visit Canyon Town Center today!